Located in Queaux, New Aquitaine, France, this majestic building was listed as early as the 14th century, when the Hundred Years War began. Bought and renovated in 2009, is totally open to the public and was listed as a Historic Monument by the Ministry of Culture in June 2010. Fougeret offers unique experiences, organized in workshops, mediums introduce you to turntables, ouija and communications with the invisible. This unique place, because haunted, is conducive to these extraordinary contacts. In a timeless atmosphere, for one night, walk the castle with a medium and apprehend yourself this other dimension. AND DO NOT ABSOLUTELY FALL IN THE ORDINARY FRAMEWORK OF BED AND BREAKFASTS. 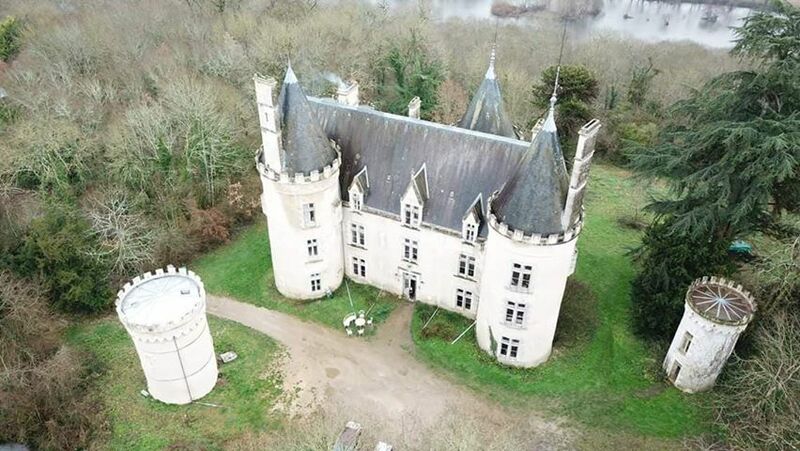 The most haunted castle in France, is the only place in France where conferences are organized on the theme of life after death, and where are extraordinary spiritual experiences are lived by visitors. This Château, truly haunted, is a real laboratory and attracts, as such, all paranormal fans. Voice recordings from beyond the grave, ectoplasmic photographs, psychokinesis phenomena. Fougeret asks to be heard to and observed. You will not be a consumer or spectator of your stay but an ACTOR. We welcome people who have a taste for experience and immersion. If you do not feel able to give up your habits, do not come. Here time does not count, it froze centuries ago. And it is with this time, again, that you will create your night. Here, do not sleep or little sleep, is your sensitivity. François-Joseph Geffroy is a farmer in the organic agriculture and very committed to respecting the environment and well-being. Véronique Geffroy is a doctor in History and a degree in Art History. Passionate about heritage, she acquired in 1999 a keep inscribed M.H, for the symbolic franc, she has created an association of medieval shows and the restoration. Arrived in Fougeret in 2009, the couple knew nothing about its particularity. The Geffroy and their 3 children discovered it shortly after the acquisition of the château. After raising doubts and inviting mediums, they decided to share their extraordinary experiences and continue the research in this area. When we arrived in Fougeret in March 2009, we totally ignored his history. We fell in love with this unusual castle but we did not know why or how it was going to change our lives. Fougeret came into resonance with our own existence because its story and ours was strangely similar. In ancient times, the Druidic sources of Fougeret were places of worship. The villagers went there to cure skin diseases or to have children. A magic link existed from the beginning on the site, well before the construction of the castle. The place known today as « the Gate », was named « the gate of the damneds” in the Middle Ages and saw some convictions of witches, burned alive, along the banks of the Vienne. In the 14th century, one of the founding inhabitants of the castle, the family Frotier, was Templar. This order is known to have suffered the treacheries of Philip IV The Bel who wanted their gold. In the 17th century, Louis Taveau, born on April 11, 1681 in Moussac in Vienne, married Marguerite Thérèse of Maillou on July 26, 1714 in Moussac in Vienne. There is a notary’s study in XVII and XVIII in Queaux. There are two notaries and a bailiff. Louis Taveau de Fougeré has 28 trials in 27 years. He levies taxes but does not pay his. He kills, with axes at the royal officer, the usher who pursues him for debts and buries him in the deepest crypt. We found bones. He refuses the seizure that hangs over him. Taveaux are a large family, linked to Rochechouart Mortemart some of which are the grandmother of Richelieu and Madame de Montespan. A strange story is reported about this family : Renée Taveau is engaged to François Rochechouart Mortemart, 7 years old. Years later, the lady falls ill and is buried in the family vault of her husband. A valet notices the ring of the deceased and decides to remove it. He draws the lady from his lethargy, they will have many children. The tale of Sleeping Beauty. The tale of Fougeret is running. In the 18th & 19th centuries, marriages, deceptions, adulteries, everything is allowed to acquire Fougeret or keep it. The primitive history of the site has definitely marked the place of the feeling of lust. The French Revolution will see the owners change. From the founding nobility, knights and fighters, will give way to the envious bourgeoisie. Louis-François Bonaventure, Sieur de Prélong, marries Marguerite Taveau de Fougeré in first wedding. The daughter of Louis Taveau, who killed an usher with an ax. The wedding takes place on February 24, 1767. She is 42 years old and he is 33 years old but Fougeret is a very coveted place. In1803, after the death of his wife, Louis François Brun Prélong, then mayor of Queaux, became 70 years the sole owner of Fougeret. His brother Louis Alexandre Brun Puyrajoux may dream to inherit one day from Fougeret, three weeks before the death of Marguerite Taveau, he has regularized his own marital status; at age 62 on June 27, 1803, he married his mistress Jeanne Garestier and legitimized their two children: Frédérique Brun Puyrajoux and Alexandre Brun Puyrajoux. The branch BrunPuyrajoux is ready to take a day Fougeret … But Louis François Brun Prélong, the old mayor of Queaux decided otherwise: January 22, 1806 he married Anne Adelaïde Rigaud, who is his younger brother of 51 years. Anne Adélaïde sacrifices her youth for Fougeret. She gives him two sons: Louis Alexandre Théodore Brown Prélong and Henry François Léonard Brown Prélong. The two young Brun Prélong become the natural heirs of Fougeret. It is very likely, however, that their mother Anne Adelaïde Rigaud, before marrying her very old husband, had obtained the promise to dispose of Fougeret all his life. On September 6, 1814, who had become a logical widow, she remarried and this time chose a younger brother: Xavier Regnault-Rochefort, her new husband, was nine years younger than herself. The couple has two daughters and lives in Fougeret. The castle seems to be in the hands of the RegnaultRochefort.When Anne Adelaïde Rigaud dies in Fougeret November 5, 1866, she is 82 years, the transmission chain by silver marriages ends. Xavier Regnault-Rochefort, who has occupied the premises since 1814, is accountable to the real heirs: the Brun Prélong. It is most likely in these complex conditions that the castle is sold in disaster. Henri Léonard Othello Brown Prélong, the grandson of Anne Adélaïde the sacrificed, is mayor of Queaux from 1835 to 1863. He marries Jeanne-Clémentine RabetheChatillon, They have five children including Angélina Brun Puyrajoux who marries Louis Robin Médard, the parents of Felix. The couple lives in Niort and Fougeret is their country castle: Louis Ernest dies in fact in Fougeret August 20, 1889. His widow, Angélina, whose name we recorded through instrumental transcommunication several times, including once in Au With each generation, Fougeret takes its due … Says the mediums. The building is built on a druidic source. Felix was found dead in December 1898. He was 39 years old. He did not seem worthy of being Fougeret’s successor. He would have ended his life but was probably pushed by his family to this end. The successions for Fougeret are cruel. The two brothers-in-law of Felix are notaries. They manage everything very quickly. The 19th century is the century of transformations of Fougeret. It is also the period during which the magic rites return, the alchemical symbols are drawn to the castle and seal definitively this waltz of spiritist energy and obsession that we live on a daily basis. In the 20th century, the Robain family acquired Fougeret. Paul is a lawyer but rarely pleads. His life comes down to politics. Alice marries Arthur, Viscount of France. The wedding takes place in July 1924 in Fougeret. Alice dies 4 months later at Maubeuge hospital. Her body is brought back to Fougeret to be watched. Alice died at the age of 22, and 4 months pregnant. When my daughter was the same age, she caught her illness but gladly got out of it. Paul, Alice’s father, is no longer working at all and is in debt. He gives up the castle to his friends and creditors; the Auriau. They will not stay long in this place, energetically too strong. It is bought, then bought back and the story is always the same up to us : Wars of successions, magic, alchemy, and struggles for power. Never deceive Fougeret, he does not like the arrogant. 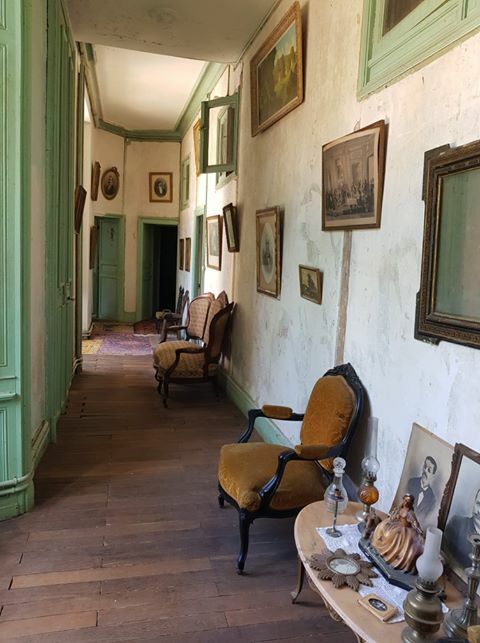 The interior decoration of Fougeret is voluntarily out of time : Fougeret remained frozen in its history, at the time during which our invisibles were still alive. No objects from outside should betray the spirit or the spirits of the place. The furniture was already, mostly present, as for trinkets and paintings, they are posed or hung with the defects, the pangs of time. These are all signatures of their own existence and their energy thatsometimes interacts with the inhabitants of Fougeret. was in this room. A soldier told us he was present and fell in the trenches at the age of 20. Paquot in the archives … The sleepers hear it and often hear the metal noises of the irons that cross this old weapon room. died in 1854, of meningitis, refuses that we open her box where she is hiding her clothes and her teeth. A porcelain doll has been mysteriously found with the smashed head and the bed, enthroned in the middle of the room, slipped by itself a meter, causing a big noise but without bending the carpet. In this room, the sleepers feel watched and the door handles turn alone. Alice was part of the golden youth of the 1920s. Her youth was swept away in mid-flight by illness at 23 years old. Alice married the Vicomte de France in July 1924 in Fougeret and she died at the hospital in Maubeuge in November of the same year. Her body is brought back to her room at Fougeret, for the evening, and sometimes, we still feel this incense of church, when she agrees to manifest. In this room, Félix, one of Fougeret’s famous ghosts, has lived on very unhappy days. Tortured by remorse, annihilated by his impossible love, the bankruptcy of his father’s company, who died in Fougeret as well, he would have killed himself in 1898. In this room, objects have moved, blows in the walls have been heard and the impossible love of Felix would still be there. The former office of Felix is now a room. In this office shots were recorded in instrumental transcommunication, the door handles turn on their own and footsteps stamp in the little hallway and the books fly. Felix has already been seen crossing the corridor of his room at his office. Louis Taveau was lord of Fougeret in the eighteenth century. He levied taxes but did not pay his. A bailiff pursued him. The usher became too urgent and threatening Louis Taveau with seizure. One visit of too much pushed Louis to the crime. Louis axed the sherum of the usher who died immediately and was buried in the second crypt. 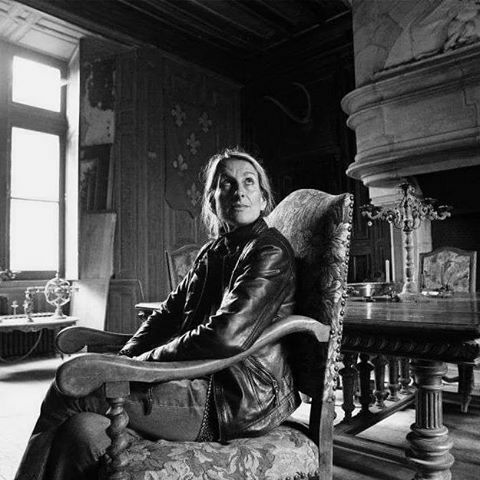 In this room, objects are thrown by the invisible force of the still present anger of the former owner of the Château. The mattress vibrates and moves alone but if Louis does not like arrogant, he lets the humble sleep in peace. This room was a guardroom. We had a communication with a man claiming to be a knight and having spent his life defending Fougeret. He asked us to recite the « Our Father » in Latin and not to befriend God during our prayers. He turns and watches again and we can hear his heavy steps. He often cries because he no longer recognizes his Château and regrets that the windows opened by the bourgeoisie have damaged the feudal aspect of Fougeret. This room was that of the owners of Fougeret. In the Middle- Ages, it was the boardroom. hairdresser moved alone. This large room has a magnificent monumental fireplace. In this room which is in a tower, a granddaughter no longer exists was photographed without her knowledge. We have seen it many times. The balloons play alone and the rides turn alone and in silence. She sometimes laughs while watching you sleep and her voice has been recorded several times. She said: « the tales of Perrault? », « Who are you? » Or « Mama who it is? holidays. She whispers in the ears, tenderly touches the hair of the sleepers and kisses them on the forehead. Her bedside table moved alone and a book crossed the room. She gave a slap, a day of visit, to an arrogant child. She did not give up her principles. This room is inhabited by a man in a bowler hat that appears from time to time, sowing the dread of stunned visitors but do not trust this first impression, he is alone and sensitive and feels excluded from the big family of ghosts of Fougeret. These are his words to the Ouija. Sleepers hear his breathing and when he sits on the bed. • Elisabeth VAESKEN-WEISS, Bruno VAESKEN, Mysterious Places in Poitou-Charentes, ed. West France, 2014.